There’s something extra sweet about the colour gold at Laurier these days: it goes beyond the golden hawk to include bees – honeybees, to be exact. Through a partnership between Laurier’s Sustainability Office, Facilities and Asset Management, and the Office of Indigenous Initiatives, two beehive colonies already call Laurier’s Northdale campus in Waterloo home. The buzz will hit the Brantford campus in the spring, when two colonies are installed on the rooftop of Market Square. The colonies are registered – as required – with the Provincial Apiarist of the Ontario Ministry of Agriculture, Food and Rural Affairs. They can house between 50,000 and 80,000 bees at peak capacity, according to the Ontario Beekeepers’ Association. One beehive can produce more than 100 pounds of extra honey, which can be harvested by beekeepers. Two full-time Laurier staff members, grounds services manager James Emary and Sustainability Office outreach and program coordinator Tyler Plante, are trained in urban beekeeping, with more staff and students to be educated and involved in the operations of the apiary. Plante, Emary and student group Laurier Enactus are harvesting the honey produced at the Waterloo campus hives. Enactus led the branding of Laurier Hawk Honey, one of nine projects selected for the 2017 Hawkstarter crowdfunding campaign organized by Development and Alumni Relations. Funds raised through the campaign will help the campus partners add more hives to the apiary, with one hive dedicated to supporting experiential learning opportunities. Enactus Laurier also facilitated the university’s application for a Bee City Campus designation, which if successful, would make Laurier among the first universities in Canada to receive the designation. Assistant Professor Richelle Monaghan, cross-appointed to the departments of Health Studies and Biology, is excited by the momentum at the Waterloo campus and looks forward to the installation of Brantford’s campus apiary in the spring of 2018. She, along with staff members Elaine Francombe and Jennifer Ryde, have worked diligently to bring the bees to the Brantford campus. “As a parasitologist, apiaries provide a great learning, research and teaching opportunity,” says Monaghan. The resource would give Monaghan the chance to work on establishing a honeybee cell line, something scientists have been trying to do for decades, she says. To develop a cell line, cells are removed from a honeybee and grown in a lab to establish a primary culture. With a primary culture in place, the hope is then for individual cells to divide indefinitely and become cell lines. 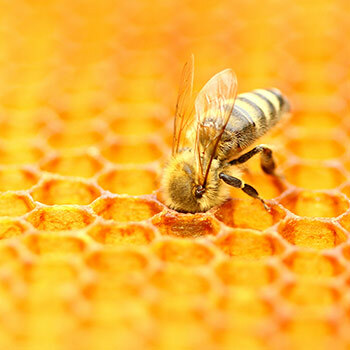 If accomplished, a cell line would share the same genetic composition as its honeybee source – an invaluable scientific resource, according to Monaghan. “A cell line would play a valuable role in understanding host-specific responses to intracellular parasites and viruses, and cellular responses to pesticides or other environmental chemicals, while reducing the need to use living honeybees,” she says. Monaghan, Francombe and Ryde hope to collect the honey produced in Brantford. “Honey harvest normally happens late summer but we have to ensure enough is left for the bees — so we only get honey if they’ve managed to make more than they need to get through the winter,” says Monaghan. If the bees produce enough, Laurier Gold honey would be collected and distributed as special gifts with some jars available for purchase. Proceeds from the sale of honey would be used to further support the hives’ operation. The location of the apiary in Waterloo is monitored by security cameras and equipped with first aid kits that include epinephrine autoinjectors (EpiPens). The Brantford campus apiary will also be outfitted with security equipment and EpiPens.